Two professors from Biola University’s Torrey Honors Institute — Greg Peters, associate professor of medieval and spiritual theology, and Matt Jenson, associate professor of theology — edited the new book Marking the Church, which was released in December 2016. Marking the Church explores the intersection between theological commitments regarding the church and the implementation of those commitments. The volume offers Christians an opportunity to reflect on this interaction between the four classical marks of the church — one, holy, catholic and apostolic — and the way in which Christians experience the church in their daily lives. Peters believes it is important for Christians to consider, read and write about the church for the sake of practicing intentional Christianity. 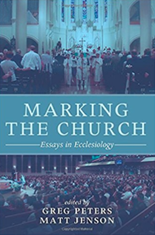 Marking The Church explores the ideas of ecclesiology pertaining to evangelical churches. Jenson, along with theology professors at universities across the United States, contributed individual chapters pertaining to different ideas surrounding ecclesiology. Jenson authored the chapter, “The Church Curved in on Itself,” which focuses on the ideas of sin, holiness, communion and mission. The book chapters were originally delivered at the annual Evangelical Theological Society in the Ecclesiology Consultation from 2011-2014. Each author explores the Christian devotion to the mission of the church and how it can be one holy, catholic and apostolic church. Learn more about Torrey Honors Institute.